Attending the 2019 CTDA luncheon were: (left to right) Ben Wysocki with Federated Insurance, Billy Eordekian of 1-800EveryRim, Chris Barry with ITDG, Brian Rigney of TIA, Allan Keefe of SEMA, and Matt Burrows with Yokohama. The California Tire Dealers Association (CTDA) works at protecting and promoting the well-being of the California tire industry by providing a unified voice before state, county and local legislators and regulators. Other goals of the organization are to provide benefits and a platform for members with interact in a meaningful way. Getting things off to a strong start in 2019, the CTDA invited its members and industry guests to a lively and successful interaction, the CTDA-Federated New Year Luncheon, which took place Jan. 16 in Santa Fe Springs, California. Federated Insurance was the Title Sponsor for the event, joining Host Sponsor 1-800EveryRim, Gold Sponsors Yokohama and Lakin Tire, and Silver Sponsors Myers Tire Supply, Pirelli, Penn Tire and Net Driven. 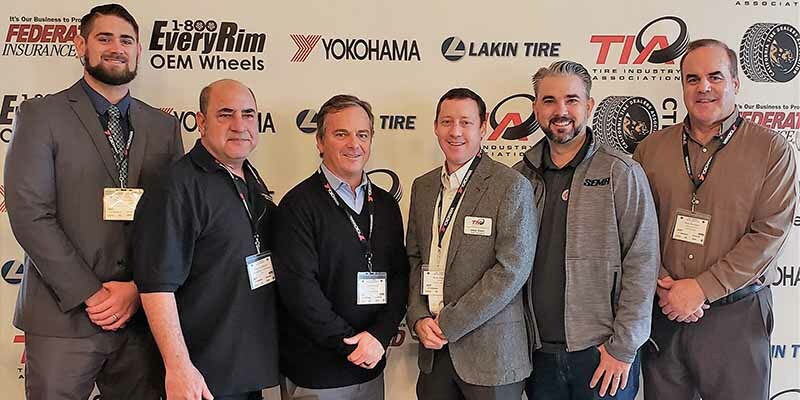 Current TIA Vice President Brian Rigney of Dill Air Controls, and SEMA Wheel and Tire Council Senior Manager Allan Keefe were the guests of honor and provided a national perspective to those on attending. Attendees included representatives from 48 companies and organizations, including 1-800EveryRim – OEM Wheels, A & R Tire, Allen Tire Company – Corporate, American Tire Depot – Corporate, American Tire Distributors, Automotive Training Institute, Coats, Continental Tire, CTDA, Daniels Tire Service – Corporate, Dill Air Controls, Falken Tire, Federated Insurance, Freedom Tire, Grand Prix Performance, GT Radial, Independent Repair Tire Pros, Independent Tire Dealer Group (ITDG), J & J Tires and Wheels, Kings Tire Wholesale, Kumho Tire, LA Sierra Tires & Wheels, Lakin Tire West, Leininger & Short, LKQ, Maxam Tire, Momo Automotive, Myers Tire Supply, Net Driven, Penn Tires, Performance Plus Tire, Pirelli, Service Capital, Savas Tires, Saemie Corp., Sunrise Auto Center, Tire Guys, The Plus Sizing Guide, The Wheel Group, Tillery Consulting/Artillery Tires, Tire Network, Tires Warehouse, Tom’s Automotive Service Center, Treadwerkz Performance Wheel & Tire, Turbo Wholesale Tire, Wayne Williams Marketing, Wheel Warehouse, and Yokohama Tire.